I have now been in this business of Gondolas for over 37 years hear in Long Beach. I was born and raised here on Naples Islands and its environs. I have brought a team to Italy to participate in a rowing event called the Vogalonga now for 34 years. I have had the opportunity to experience and learn a tremendous amount of Italian culture and food traditions and techniques. I have also owned a few restaurants including a 150 seat Oceanfront Italian Restaurant in Long beach from 1990-2000. Through my travels, cooking and my localism, I feel I have a good pulse on the local food and entertainment scene near our location that can best compliment your unique experience at the Gondola Getaway. Of course, the local food buzz is constantly changing so we will try and keep you current, but here are some local suggestions that are presently suggested. A local favorite Italian/American joint with checkered tablecloths and Vine wrapped trellises. You might accidently burst out in an “O Solo Mio.” They have been here in the Shore for more than 65 years. Famous for their portions and their unique pizzas where the cheese goes on first before the sauce. Locally world famous for their “ground” peperoni pizza. Every dinner starts with a cup of minestrone and suggested that you get there “house” salad with their own unique dressing. On the menu they have some great items like “Giant” meatballs and ground peperoni mac and cheese along with a good Clams Linquine and Lasagna. 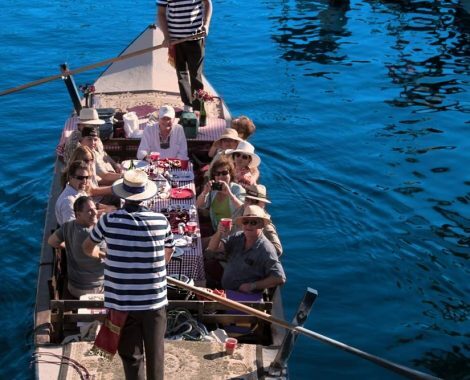 They are also the Restaurant chosen to cater our own locally world famous “Pizza Cruise” on board our large Gondola. This combo makes it the only place in the world where this experience can be had. Domenico’s likes to call it there only “floating” table. We like to call it the only Gondola floating Pizzeria! The owner is a good friend and makes sure all of the Gondola Customers get the VIP treatment! Naples Island actually has an authentic Neapolitan Pizzeria! The classic brick oven sits in the back and can be seen from every table. Everything hot on the menu comes out of the 700 degree oven. The pizzas are made in the classic Neapolitan tradition from dough to heat. Other Items like lasagna and sausage also is finished in the intense heat of the oven. There is a nice selection of craft beers and good wines. Their arugula salad has no par in Long Beach even as simple as it is with the perfect Oil/Vinegar blend and shaved parmesan. They also have the Italian requisite of good chili oil on the table. The service is spot on! 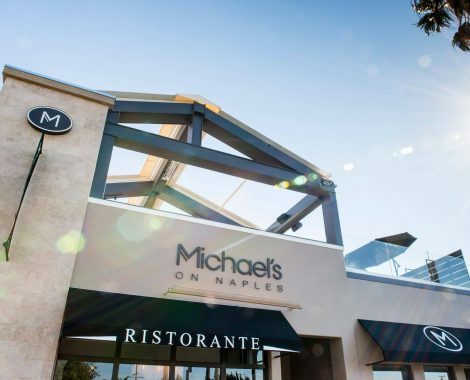 Right next door is Michaels other Italian endeavor of Michaels fine dining Ristorante. 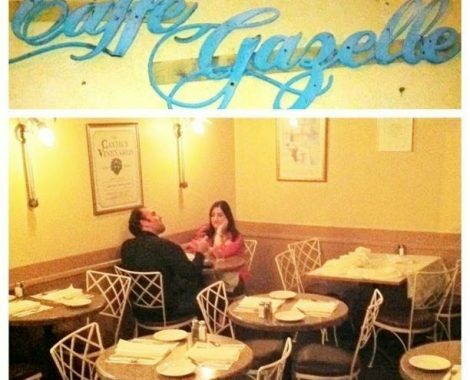 In all of its Zagat performing services it still has a local feel of Naples Island. The dining room is filled with locals and Zagat hunters alike. The food is Top notch Northern Italian. Though I prefer the Venetian style of “all’ Onda” risotto, their Milanese style is just about perfect. Upstairs has what I think is the “coolest” bar on the Island. With outdoor and semi outdoor dining with a retractable roof is as hip as it can get in the area. They have an exceptional happy hour every day from 5-7 with half off wine and apps. A great place to hit before or after a Gondola ride through the Island which Michaels sits on! You might think Michael Dene is the “Dictator” of Italian cuisine on the Island of Naples. This is yet a 3rdplace you can get your Italian fix controlled by the Michaels restaurant group. This one though is all about “Carne”, and just any Meat. Florence, Italy made the steak Florentine famous. Famous there because the meat comes from an exceptional local breed of bovine called, Chianina, the same name as this Sleek Italian Steak house. The Ristorante actually owns stock in this bovine “stock.” They actually own their own local herd! It also has sleek, upscale bar acclaimed for its rotating menu of artisanal cocktails and spirits, located at Chianina Steakhouse. At Chianina, our philosophy revolves around a shared dining experience and our signature steak, the Bistecca alla Fiorentina. Before they offered the Tuscan dish on their menu, you had to travel to Florence, Italy, to get a taste of this unique, family-style-served Porterhouse. Italian dry-aged to perfection and sliced tableside, the Bistecca alla Fiorentina comes from a single breed of cattle named Chianina (pronounced Key-a-nee-na). They are the namesake of the restaurant, and they responsibly raise their own herd at Huggins Ranch in Utah. The Bistecca all Fiorentina, a Porterhouse bone-in cut, is an ancient art featuring a New York steak and a Filet Mignon. The Porterhouse strikes a delectable balance between flavor and tenderness, but the true beauty is in its simplicity. After being grilled—rare or medium rare—the steak is basted with rosemary sprig olive oil and served immediately. Nothing more is needed. Meant to be shared with your table, our Bistecca alla Fiorentina will reacquaint your spirit with tradition and your palate with something extraordinarily unique and wonderful. This warrants a special occasion to splurge on such an Italian delicacy, like maybe, after and enchanting Gondola ride! Now that’s a passport to Italia in your ownbackyard. It also has sleek, upscale bar acclaimed for its rotating menu of artisanal cocktails and spirits, located at Chianina Steakhouse. The Bistecca all Fiorentina, a Porterhouse bone-in cut, is an ancient art featuring a New York steak and a Filet Mignon. The Porterhouse strikes a delectable balance between flavor and tenderness, but the true beauty is in its simplicity. After being grilled—rare or medium rare—the steak is basted with rosemary sprig olive oil and served immediately. Nothing more is needed. Meant to be shared with your table, our Bistecca alla Fiorentina will reacquaint your spirit with tradition and your palate with something extraordinarily unique and wonderful. This warrants a special occasion to splurge on such an Italian delicacy, like maybe, after and enchanting Gondola ride! Now that’s a passport to Italia in your own backyard. La Parolaccia, in Italian, literally means “The Bad Language.” In Italy, the Osteria is a modest place where friends and family gather to enjoy homemade food, great wine, and very often some “bad language” would be used. 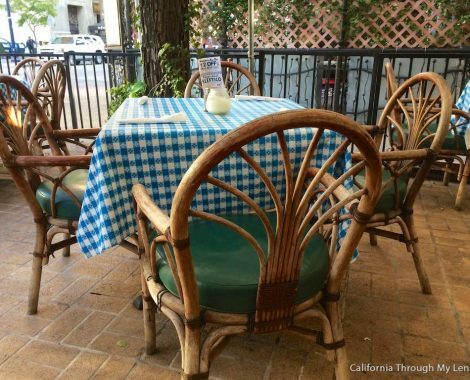 La Strada is a classic neighborhood restaurant, checkered tables and all. Your visit will begin by being greeted by a friendly face, followed by the arrival of a basket of their famous fresh bread that has just been baked in their pizza ovens. It’s that classic Italian crunchy roll. They serve the simple style homemade Italian food you might find in a classic trattoria in Italia. 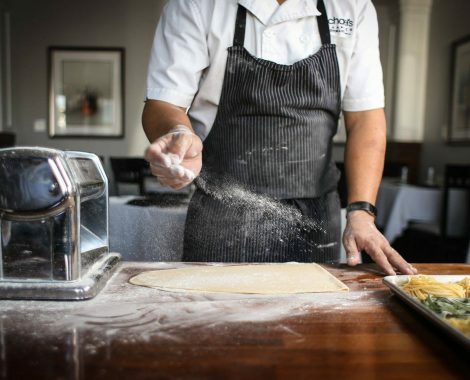 From the basic Penne Pomodoro to the more elaborate Lobster Ravioli, every dish on the La Strada menu is cooked consistently with fresh ingredients. The atmosphere is lively with all the front windows that open to the sidewalk in the summer. It’s got the right kind of “noise.” It has that energy that you might find in an old piazza in a small town in the Italian countryside. An Italian Pasta joint for sure. Every heard of great hole in the wall? Well, this is smaller than that. It only seats about 18 people. The owner is the server who barely has to move to hand you your meal from the Chef. A very consistent menu, I don’t think they have changed it in 30 years. The specials are even the same. Did I say consistent? You will be surprised of how many veal dishes they serve. All pretty much scaloppini style. I like to call it a pasta and Veal joint… Same owner, same menu, same cook all adds up to a very small, consistent Italian joint that is heavily populated by locals. No reservations so take a chance or eat early or late! A classic New American Seafood/Steakhouse with great pasta too! A very cozy atmosphere with local elegance. George the owner is always there to greet you. The service is local non Zagatish. We like to call it Local Neapolitan because they cater so well to the Local Islanders. The bar is a happening place where you will meet some interesting successful locals. Starchy white tablecloths and shiny silverware abound in the chic dining room that is shared with the lively bar. Upstairs there is more lush dining without the vibe of the bar which some prefer. It’s a bit more romantic upstairs. There is also a back room near the wine lockers that is great for a small group to take over. Very loungy room with a dining table and couches. Local, Local, Local where you can become one with just a reservation! 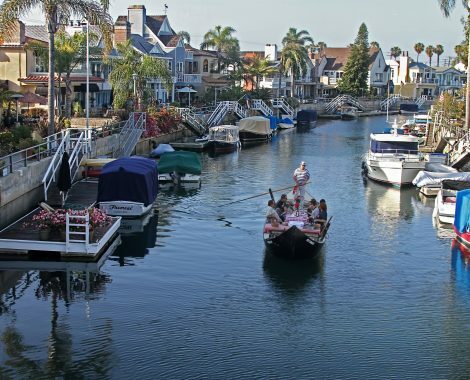 Picarelli’s is just two bridges away from the Gondolas located right off PCH. It offers An Italian experience in Long Beach. From the comfortable Italian plaza atmosphere to the authentic Italian food. The menu is quite regional with many of the Italian classics from tagliatelle to Tiramisu and all the veal’s in between. It feels a bit like you are sitting in an outdoor plaza in Venezia. The full bar alone is a cool joint with some very classic bartenders. The owner, manager and bartender are legendary in Long Beach. The outdoor patio offers an al fresco feel on a warm summer night! 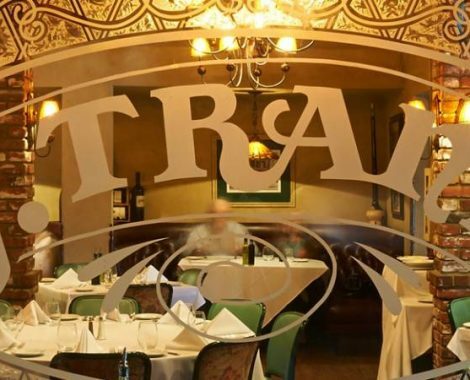 Phil Trani’s is not just a great place to eat delicious food, it’s like an all inclusive social club, where on any given day you might have the opportunity to rub elbows with sports superstars of the past, present, and future. you can see many of their autograph on Phil’s famous kitchen walls. I first went to The Trani’s “Magestic” in San Pedro when I was about 8 years old. My dad knew the family and the only way I ever remember entering the restaurant was through the Kitchen! This a true old school family restaurant. Years ago, Phil Trani came to Long Beach to open up his version of the family restaurant. He instills his talents and tradition in every single meal here. From Pasta to Steaks to Seafood, It is always done perfect! Big booths, Maybe the best sports memorabilia bar in Long Beach and the greatest Host of all time. More than a stone’s throw from the Gondola Getaway, but if you happen to be coming from the North to us, it’s right off the 405 and Long Beach Blvd. Absolutely let Phil know you will be at the Gondolas that evening! We have been the greatest of friends for over 50 years! This is the kind of place where Sinatra would have had his own booth in the back corner! A Bayfront restaurant offering spectacular water views, amazing sunsets and an outstanding Long Beach dining experience. The Boathouse on the Bay is a steak and seafood restaurant situated on Alamitos Bay in Long Beach and serves an array of fresh seafood, steak, sushi, sashimi, oysters and cocktails. They have a happy hour, live entertainment great friendly local style service and cuisine that covers the spectrum. The Boathouse has one of Long Beach’s best happy hours! Visit 2-6 PM Monday-Thursday for happy hour specials. Enjoy live music seven nights a week. This is a bit of a hidden treasure situated along Alamitos Bay, deep within the beautiful Marina Pacifica, and is one of Long Beach’s best-kept secrets. Step inside Tantalum and take a journey into culinary paradise. Specializing in an eclectic menu of New California Cuisine with an Asian soul, Tantalum promises to please even the most discerning palate. Their innovative menu showcases complex flavor profiles designed to excite and heighten the senses. All menu items are created to pair well with either a glass of wine or any one of their exotic cocktails. They make a great Mai Tai! A chic interior evocative of the Indonesian Islands couples dark woods with lush foliage, providing a luxurious backdrop in which to relax with friends, entertain guests, host a private party, enjoy live entertainment, or simply impress that certain someone. The 75-foot mahogany bar and ultra-hip dining lounge offer breathtaking panoramic bay views as well as a perfect place to sit and watch the sun go down. Treat yourself to our complimentary valet or take advantage of over 1000ft of private docking space; whichever way you decide to travel, take a trip to Tantalum and experience the extraordinary combination of sexiness and style. Maybe only a 10-minute drive from Italy to Indonesia! Opened in the summer of 1990, Belmont Brewing Company is the oldest brew pub in the Los Angeles County. Our mission is to continue to proudly craft and brew our staple beers. As so many breweries have proven, great food can be produced here also. Their menu goes from pub grub to Oceanfront casual Steak and Seafood. The views are intoxicating of the Long Beach Oceanfront. Sunsets are incredible with Catalina Island as a backdrop. The restaurant is only about 5 minutes from the Gondola so it’s an easy stop before or after a cruise. Why eat in a bar when you can dine in a Brewery! The brewery is a seven-barrel system manufactured by Pub Brewing Systems. They have two, fourteen-barrel fermenters and two seven-barrel fermenters as well as seven serving tanks. This system operates at near capacity and produces over 1000 barrels annually. David Blackwell, a friend of mine, has been their brewer since April of 1999. After several years as a home brewer, Blackwell began brewing professionally in Albuquerque. He worked for two and a half years at Kelly’s Brewery before moving to Long Beach. Blackwell brews simple, recognizable ales; Clean Blondes, Hoppy Pales and IPAs, Balanced Ambers, Big Stouts, Fruity Weizens and Spicy Belgians. We have teamed up with Domenico’s, one of the famous local pizza joints, to produce the one and only Pizza Cruise on a Gondola, in the world! It’s like a floating pizzeria in the enchanting canals of Naples. Check out the website for more info. There is no waterfront view like sitting on a gondola surrounded by water! Roe They the official home of the seafood fanatics of Belmont Shore! Very cool, chic joint on 2nd st just 3 minutes from the Gondola Getaway. They serve the freshest of Seafood in the most amazing style. Really cool bar with craft cocktails and good wine and beer. They have an express place next door where you can get casual seafood specials, poke and even by Fresh fish. The whole front of the Restaurant opens up onto the street, so the dining is totally Alfresco! You could even walk the beach from the Gondolas too. Our local rib joint on the Island of Naples. Super, super consistent and good. Everything a Rib joint should have is there! And its only 5 minutes from the Gondolas. So, if Ribs is what you call the perfect combo to a Gondola ride. We have you covered! The owner is a good friend and is super involved with the community and will make sure you are treated like a local. It’s got a really cool sunken bar also! They are serving authentic Greek cuisine straight from Mama’s recipe book made from only the finest, imported ingredients. 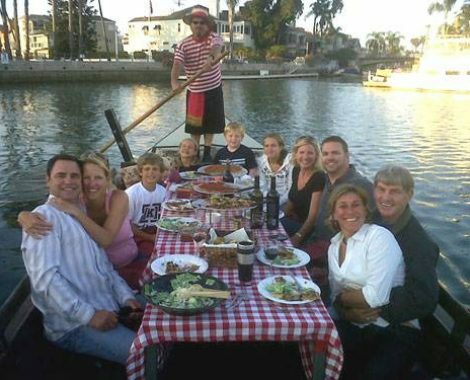 Georges has a few restaurants in Long beach but the closest to the Gondola dock. They have become a true local tradition here in Belmont Shore serving classic Greek cuisine. They even have the flaming cheese brought table side. I have never heard the breaking of dishes, except maybe by accident, but you will enjoy the flavor of Greece and great dining experience. Make it a European vacation with a stop in Venezia and Mykonos! An aromatic staple of Belmont Shore serving fantastic exotic Lebanese food. Always busy because of its uniqueness, flavors, service and consistency. Great Ambiance and a unique dining experience. The owner worked in a spice factory in Lebanon as a young man and has now brought those exotic flavors to the “Shores” of Long Beach. This combo with the Gondola will make for a romantic and exotic experience you soon will not forget! 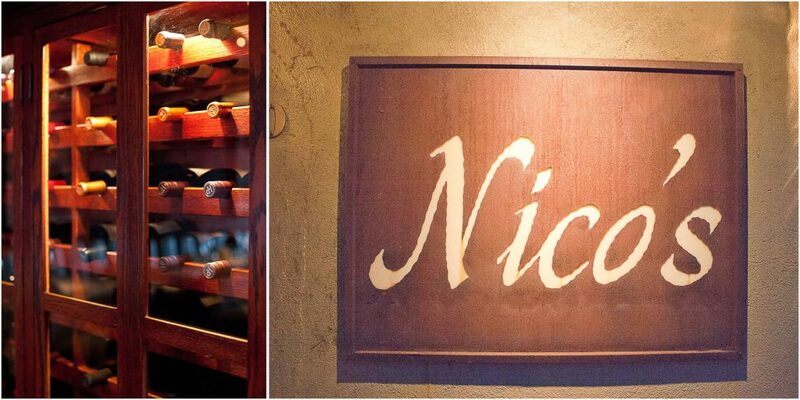 Nick’s is dedicated to perfecting the dining experience through continuous innovation, offering the highest quality food and beverage, and executing impeccable standards of hospitality. The deeply instilled Nick’s culture is personified by its Ladies and Gentlemen – professionals who share a single focus and are inspired and committed to offering great service and creating positive memorable experiences. The cuisine here is sleek, unique and always flavorful. You will be satisfied and stoked with every part of your experience here. Combine this with the Gondola cruise and you will have a 5 star romantically casual evening.